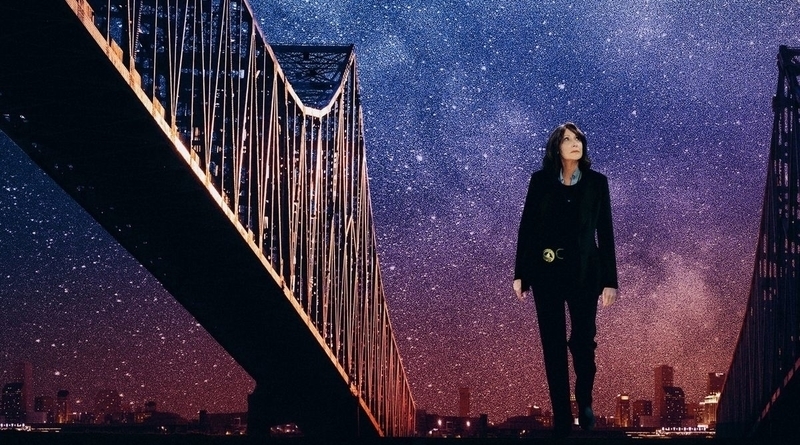 Carol Morley’s latest film, Out of Blue, deconstructs a familiar premise with curious questions, openly clashing its themes and style to cosmic effect. There’s an expectation that neo-noir will primarily bring together traditional detective tales and a modern setting, sometimes using surrealism or futurism to further explore the themes. Refreshingly, with Out of Blue director Carol Morley shuns this format to instead ask grander questions of her story, finding a correlation between the universe and homicide. It’s a journey down an ever deepening well of mystery and darkness that both black holes and murders project onto consciousness. Patricia Clarkson plays Mike Hoolihan, a detective for the New Orleans Police Department who is investigating the murder of astrophysicist Jennifer Rockwell (Mamie Gummer). Her grisly death – shot in the face at point blank range – bares similarities to murders committed by the .38 Caliber Killer, a murderer who was never caught for their historic crimes. After witnessing the classically staged crime scene we quickly get into questions about who did it. The two main suspects are colleague Toby Jones and boyfriend Jonathan Majors. Small clues are thrust on us as to how they could be involved: a missing sock, dirty fingernails, but these are never Hoolihan’s focus. She’s always looking beyond these small details to something larger, and in looking at the bigger picture, finds perhaps the biggest picture of all. As Hoolihan continues to dig we find that not all is as it seems. The film itself acts as a facade, set up and played as a run of the mill detective story with all the tropes of a noir. A troubled detective, quiet, brooding. A pale-skinned, blonde victim. A city whose underbelly is closing in fast behind our antihero. All of these knowing nods to a well established genre draws viewers in to a plot that rests upon a grimy surface. It’s a facade that the film wears so well that at times you forget Out of Blue is severely concerned with existence, parallel universes, astrophysics and the quantum mechanics of Schrodinger’s Cat. These aren’t just themes for the plot to work around – they’re actively what the film is about. Hoolihan is portrayed as a fairly androgynous woman. Clarkson acts parodically in a role associated with male cop performances: the stern looks, hardened attitude, indifference to violence and a murky history. Beyond that Hoolihan has an unaddressed attraction to a local news reporter played by Devyn A. Tyler, and though the film makes no effort to supply the audience with romance or homoeroticism, there is certainly a small interest taken in Hoolihan’s sexuality. “Ever tried wearing women’s clothes?” asks a growingly edgy Jacki Weaver. “There’s more than one way to be a woman,” answers Clarkson. This response is not meant as a particularly feminist retort, but more as a summation of her personage: the duality in which she and everyone exists. Like the film, Hoolihan also wears a facade. Patricia Clarkson’s features barely move while the camera lingers on her expressionless mask, and though this facade shows no apparent cracks, we see that Hoolihan is gradually changing behind it, always looking further into an unexplained past. It’s apparent throughout that Out of Blue might not be to everyone’s taste. The style is at times blunt, rarely concerning itself with beautiful photography, and the script is so straight-faced that it could come across as simply naff. But beyond that there’s a great ambition in the film’s refusal to adhere to the flourishes of neo-noir. To reduce something so grandiose to such a basic yet engrossing piece of whodunnit is quite a remarkable feat. It’s a truly daring piece of cinema. Out of Blue is on wide release now, with showings at the Birmingham Cineworld.